If I say “Mondrian” to you, and you know something about art, then into your mind will pop an image I can confidently describe. It will consist of a set of coloured rectangles, red, yellow or blue, interspersed with white, and set in a grid of black lines. Some rectangles will be bigger. Some smaller. There may be lots of white. Or only a little. But as sure as eggs is eggs, the rectangles, the grid, the red, yellow and blue will all be there. I describe this to you with certainty not because I am the Great Waldo, mind-reader extraordinaire, but because the art of Mondrian has such a distinctive flavour to it and has embedded itself so firmly in the collective conscious. At the Gemeentemuseum in the Hague — where you can currently visit a set of exciting exhibitions devoted to De Stijl, the pioneering Dutch modern movement that celebrates its centenary this year and which set out to redesign every aspect of the way we live — they have a dress hanging up created in the 1960s by Yves Saint Laurent. It’s his “Mondrian dress”, a bestseller. What does it show? Red, yellow and blue rectangles, white background and a black grid. Of course. The point I am trying to make is that Mondrian’s abstraction is fixed firmly in our visual history. It’s immediately recognisable. So recognisable that it dominates our view of his achievements. We don’t, perhaps, imagine that the famous rectangles were all he ever did, but we do imagine that everything he did was a careful preamble to them. Quite how wrong that opinion is, quite how misleadingly it presents Mondrian’s arc, is made obvious by a tremendous event at the Gemeentemuseum that barges aside the usual image of him and replaces it with one that is altogether more nuanced, fuzzier, more complex, spooky and surprising. It’s like watching a professor of mathematics being outed as a madcap spiritualist. Where the old Mondrian slotted perfectly into the story of modernism, the new Mondrian doesn’t slot in anywhere. He sprawls, infiltrates, ecstasises, meditates and dreams. The result is a Mondrian show that challenges pretty much everything we have ever assumed about him. 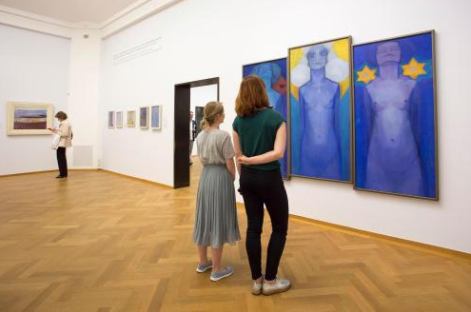 The Gemeentemuseum owns more than 300 Mondrian paintings and drawings. It is by far the largest collection of his work in the world, spanning all his twitches and phases, of which there were an uncommon number. The museum also possesses stacks of documentary material about him — photos, letters, hand-painted postcards — as well as full-size recreations of his studios and a pile of his favourite records: jazz and boogie-woogie. All this marvellous evidence now snakes around the museum, upstairs and down, in an examination of Mondrian so detailed, I cannot imagine it being improved upon. Piet Mondrian was born in 1872. That’s a decade before Picasso and deep enough in the 19th century to give him an unusually long run-up to modernism. When we encounter him here, circa 1890, he is a teenager who paints doomy still lives in the manner of the Dutch Old Masters: a jug, a dead hare, a basket. Technically, he is immediately impressive, a skilled realist with a taste for bleakness. Some still-life artists paint beautiful flowers to express their optimism. Others prefer battered stuff upon which they appear to visit the sins of the world. Mondrian was in the second camp. When you’re 18 years old and you paint dead hares, you are not a happy bunny. Brown remains his favourite colour during his next phase: a dank decade spent scouring the countryside around Amsterdam looking for especially glum stretches of Holland. Muddy farms. Struggling trees. Smoky factories. Blurry cows. Even by Dutch standards, it’s a morose picturing of the world, a relentless preference for the beaten up and the bleak. By hanging lots of examples of it in dense clusters, the creators of this event succeed in alerting us immediately to Mondrian’s pessimism, and also to his pictorial courage. Here is an artist with zero ambition to make things easy. If you lean in closer, however, you’ll find that beneath the glum brown surfaces there lurks a musketeer: an adventurous mark maker in love with paint. The cocky swishes and slashes employed by the young Mondrian to record his gloomy farmyards and sullen cows brought more invention to the task than the task demanded. Through the telescope, he’s glum. Through the microscope, he’s excited. It’s a thought we need to hang onto when we reach the famous rectangles in red and blue, and mistake them for something mechanical or blank. I’m rushing ahead. In fact, a rattling piggy bank of phases separates us still from the quintessential modernist. In his mid-thirties, he became popular in Holland for his evening scenes. At the end of the day, as the light diminishes and the poetry grows, he would park himself in front of a skeletal windmill or a sad clump of trees, screw up his eyes so the outlines blurred and empathise fiercely with their loneliness. It’s emotive art. Downright Rembrandtian. No amount of eerie twilight, however, prepares us adequately for the weird religious phase that follows. He’d been interested in theosophy, I read, since about 1900. But only around 1908 does it erupt into his art in a series of spooky cult images. See the bearded fellow with the crazy eyes staring out at you in the mad monk manner popularised by Grigori Rasputin? That’s a self-portrait. In the most ambitious painting of his theosophy phase, a huge triptych called Evolution, three blue nudes decorated with stars and crystals represent the stages you need to pass through to reach enlightenment. The flanking nudes have their eyes shut and must travel further. The one in the middle, the most Egyptian among them, has ecstatically arrived, her eyes so huge, open and oval, they belong on a siamese cat. So far, so surprising. Mondrian is turning 40. And only now does his trajectory begin to rejoin the expected path. It happens in Domburg, a seaside town in which the theosophists liked to gather and where the strict horizontal of the ocean was balanced by the strict verticals of the seaside defences, thereby echoing the natural order of things as described in The Secret Doctrine by Helena Blavatsky, the main teaching text of the theosophists. Horizontals were yin. Verticals were yang. The two needed always to be in harmony. Thus Mondrian, who was often to be seen meditating cross-legged on the beach at Domburg, found a mystical underpinning for the insistent geometry that began to dominate his art. What came before was interesting. What comes now is thrilling and glorious. In increasingly simplified combinations of crosses, levels and uprights, he searches for an artistic language that can successfully describe the unshakable order that lies beneath the visible world. In Domburg, he rediscovers colour and his art grows briefly pointillist. Then there’s a cubist phase. A Van Gogh phase. A De Stijl phase. An American phase. Nowhere in this huge and restless show, not even among the trademark Mondrians gathered at the end, do you sense his arrival at a final style. The last great painting we encounter, called Victory Boogie Woogie, was started in New York in 1942 and left unfinished at his death two years later. 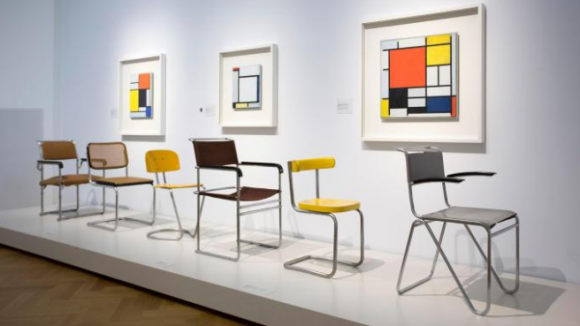 The show gives it a gallery to itself, and fills the room with boogie-woogie music from Mondrian’s own collection so that the frantic rhythms and itsy-bitsy geometry can be instantly recognised and contextualised. Victory Boogie Woogie looks nothing like New York. But it feels exactly like New York.